Discover a peaceful, refreshing stay at The Westin New Orleans Canal Place. Situated along the Mississippi River in downtown New Orleans, our luxury accommodation is steps from Harrah's Casino and the Shops at Canal Place. Take in stunning views of the river and the French Quarter from our sleek, modern rooms and suites, boasting deluxe amenities. Relax in our WestinWORKOUT Fitness Studio. Start your day with breakfast and lunch at River 127; savor Cajun-inspired cuisine and cocktails at the Green Bar. If you're in town to host a meeting or special event, you'll be delighted with our 49,939 square feet of inspired meeting and exhibition space. Explore Jackson Square, the Ernest N. Morial Convention Center, the Port of New Orleans, restaurants, nightlife and shopping just steps away. Enjoy all the benefits of our proximity to the French Quarter, without all the hustle and bustle of Bourbon Street. 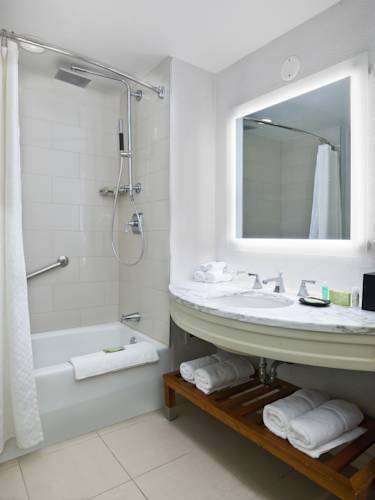 Our well-appointed hotel welcomes you with luxury amenities and premier service. River 127: Stop by River 127, our restaurant in downtown New Orleans, before heading out to the convention center, located near our hotel. Treat yourself to our bountiful breakfast buffet or enjoy our Cajun specialties for lunch, enhanced by dazzling city views.